“I’m really passionate about movies as an art form, especially the cinematography and directing aspects of it,” She gushed, “so much detail gets included and there are so many different ways to show something, and filmmakers make everything intentional, which I think is just so cool”. 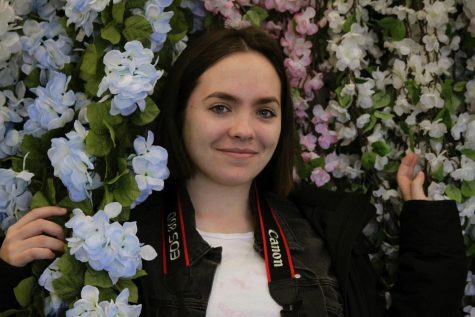 Grace plans on attending the Loyola University of Chicago for just that, well, “Film and digital media for my major, and journalism as my minor,” specifically. The Windy City has always been tied to Grace’s heart, “We visited for the first time when I was little, and I said then that I wanted to live there, and I meant it kind of jokingly then, but it’s still always been a dream of mine ever since,” she recalls. Drawing inspirations from old favorites, Paul Thomas Anderson, Alfred Hitchcock, and so on. “I love older movies especially because they’re the foundation for what we have today. So, when I’m watching an older movie, it’s not only enjoyable but also educational to see how their skills influenced directors today,” she commented. On top of aspirations for becoming a director, Grace is also in a band. Many students at Canfield have heard the song, “Blue Whale”, the title theme from The Show. This song was originally made by the band Trial and Error, where she plays bass. “I have so much fun playing with everyone when we get together,” she says. Grace began freshman year when senior members at the time Pete Crescimanno and Jake Riser, needed a bass player. From there, they’ve gone on to play multiple gigs at notable places all around the Valley, from Suzie’s Dogs and Drafts to Riser Tavern. So overall, upcoming graduate Grace Schuler has many different aspirations and passions, from music to the silver screen!